Day 10 was a relatively quick trek to the village of Lobuche (4,924m), as the altitude delta was quite minimal. Pacing was very quick by the others and I was barely keeping up. Again, weather in the morning was fabulous! Quickly we arrived at Lobuche. To my own surprise I actually didn't take any photos on the approach. Instead we found Longshen already at Lobuche. 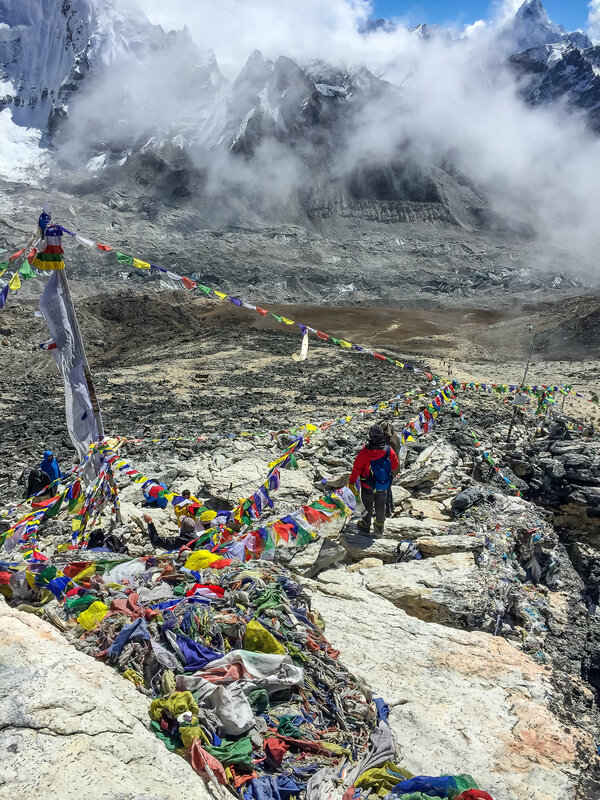 He took the southern lower altitude route thought the town of Dingboche (4,410m) to Lobuche from Gokyo. He looks to be in better health and no longer coughing as much. Since we arrived so early, after lunch, we went out to explore a bit. On top of a little ridge nearby, we were able to see the Khumbu Glacier and more of the Lhotse/Nuptse mountain cluster. Himalayan style shopping - Luncheon meat and Korean Instant Noodle were acquired! However we were told that EBC would be empty that time of the year, because it was not climbing season for summiting Everest. During October, EBC would essentially be a pile of rocks with no tents or anything special for one to see. Adding to that, one cannot even see the peak of Everest from Everest Base Camp!. As such, Sanu, Bo, and Longshen, whom have been in the region before, thought it was not worth it to stay at Gorakshep. Bo said he have had bad high altitude sickness experience before when staying a night at Gorakshep. I agreed with Bo and Longshen, and decided to skip EBC. While Kilik and Lizhen thinks the original primary objective of the trip was to reach EBC, so it was a spot they did not want to miss. They wanted to reach Everest Base Camp first, then if condition permits, will stay at Gorekshep for a night while the rest of the team heads back to Lobuche. So this means for Day 11, the entire team will trek to Gorakshep as a group first, before splitting up with half going to EBC and half going to Kalapathar. Day 12 will become a rest day for Longshen, Bo and I if Kilik and Lizhen decides to stay the night at Gorakshep to hit Kalapathar on Day 12. We woke up before the sun was even out. To our surprise, Bo decided to stay at Lobuche because of a headache. I was thinking to myself how many days I had been trekking despite of a headache... I guess it made sense because Bo have had been to Kalapathar before already. With the path lit by our headlamps and the moon, we set out for Gorakshep. We trekked for a good two hours before the sun came out in earnest. It was freezing cold despite the exertion. The trek kept on going even after sunrise, and felt like it took forever before we finally reached Gorakshep. Given the altitude, and the fact that the town is not settled year around, Gorakshep actually looked bigger and more developed than expected. At this altitude vegetation became minimal, and we didn't see any Yaks anymore. Apparently Gorakshep was the location of the original Everest Base Camp before the site moved closer to it's current location, - right next to the infamous Khumbu Icefall. After having a breakfast of tomato noodle soup at Gorakshep, we split up into 2 groups. Longshen and I were with Sanu, whom needed to make a call at Kalapathar where a cell tower is located. Lizhen and Kilik is going with Sherpa Pemba to the Everest Base Camp. The trek to Kalapathar is shorter than to EBC, but also a lot higher and a lot steeper. For most trekkers, Kalapathar is the highest point they would reach, because most other higher destinations are mountain peak, which requires a separate climbing permitto summit. Looking back at Gorakshep, we saw a constant stream of helicopters, possibly evacuating trekkers that succumed to severe altitude sickness or AMS (Acute Mountain Sickness). As we got closer and closer to the top of Kalapathar, phone reception got better and better, and Sanu started to make calls. Nepali phone conversations were occasionally interrupted by the thundering sound of avalanches. Eventually we started to see signs of fogs and clouds coming in from Gorakshep. I started to worry and managed to quicken my pace, hoping to push for the top before the view is covered like how it turned out at Gokyo Ri. Managing my breathing and giving it everything I've got, I managed to be the first one out of the group to make it to the top of Kalapathar! It was tricky to capture how it's a sheer drop off for probably a hundred meters at the very top point of Kalapathar. It was somewhat emotional. Standing right in front of the tallest mountain in the world, the scenery was overwhelming! The 10s of days of battle with the thin air and the scarcity of oxygen. The headache and the fatigue. The difficulty in keeping up with the rest of the very athletic team. Reaching Kalapathar would mark the completion of the primary objective of my trip! It was spectacular and beautiful. The entire trip have been exhausting and a rush. I did not want this to also be a rush and just a Facebook check-in. There simply couldn't be enough time spent here. The entire trip have almost been a close resemblance of life. Just one step after another rushing past everything. It's exhausting and but I guess it's also a lesson - we really have to sometimes slow our pace down and appreciate what's around us. I guess some might be rather disappointed that I did not actually make it to the Everest Base Camp. So I borrowed some photos from Kilik to showcase what Everest Base Camp looks like in October. For the record, Kilik and Lizhen made it to EBC and back to Gorakshep more than half an hour quicker than Longshen and I made it to Kalapathar and back. And the EBC trek is quite a bit further than the Kalapathar trek! After finishing lunch at Gorakshep, we went through the long descend down to Lobuche. At this point Kilik and Lizhen both decides that they will just skip Kalapathar, leaving Day 12 empty. Over dinner at Lobuche, we were told that Island Peak high camp is no longer recommended after the 2015 Nepal earthquake. All Island Peak summiting have became an arduously long single day event starting 1am in the morning! 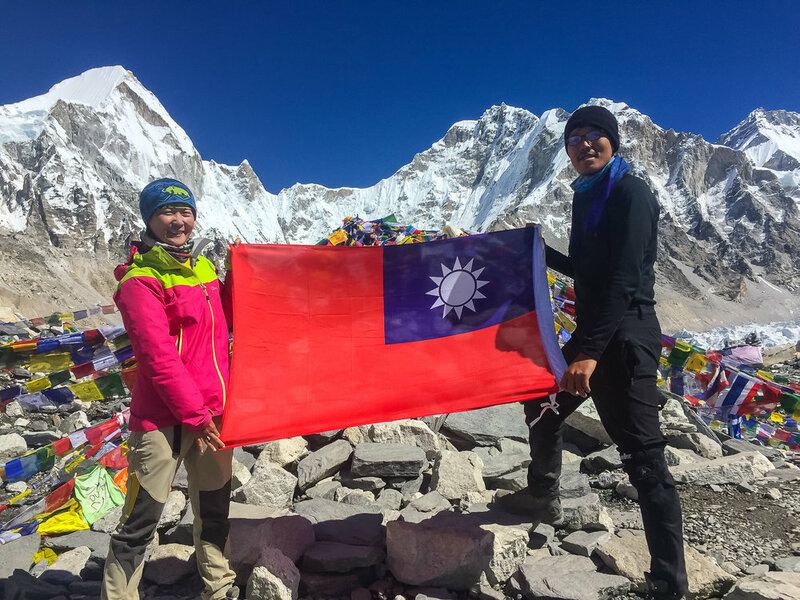 At that point, Lizhen and Longshen opt to not do the Kongma La pass and instead go through another southern lower elevation route through the village of Dingboche. Stubbornly, I was determined to complete all 3 passes, despite being completely exhausted and often painfully slower in pace than the rest of the team... So once again for Day 12, we would split into two groups and reunite at the village of Chukkung.